Pines grow well in many other parts of the country as well, but they are a severe challenge here in north Texas - unless you happen to live in one of the rare sandy red soil areas. If you have what I call black and white soil, black clay on top of white rock, successfully growing the tall, straight-trunked east Texas type pine trees is a near impossibility. These pines need sandy, acid soil to be healthy long term. Lots of folks try it, works for a while but not very long unless you don’t mind yellow, sick trees. Throwing iron supplements at the sick trees is a total waste of money. The only practical solution is to plant pines other than slash, loblolly and long leaf. Pines that will tolerate our high-calcium soils include Austrian, Japanese black, Italian stone and eldarica. Austrian and Italian stone are the best of the four because Japanese Black, Italian stone, also has some trace mineral deficiency problems long term and the eldarica pine is a desert tree that suffers under heavy irrigation and rainy periods. Italian stone pine is the hardest to find in the nurseries but it’s an excellent evergreen tree choice for your garden. Better choices include live oak, magnolia, yaupon, and eastern red cedar. If you are from east Texas, as I am, you probably miss the tall pine trees. Pines grow well in many other parts of the country as well, but they are a severe challenge here in north Texas - unless you happen to live in one of the rare sandy red soil areas. 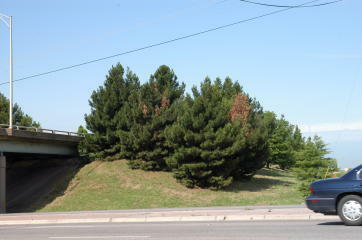 Let’s talk about the alternatives to East Texas pines. If you have what I call black and white soil, black clay on top of white rock, successfully growing the tall, straight-trunked east Texas type pine trees is a near impossibility. These pines need sandy, acid soil to be healthy. Lots of folks try it, works for a while but not long term unless you don’t mind yellow, sick trees. Throwing iron supplements at the sick trees is a total waste of money. The only practical solution is to plant pines other than slash, loblolly and long leaf. Pines that will tolerate our high-calcium soils include Austrian, Japanese black and eldarica. Austrian is the best of the three because Japanese black also has some trace mineral deficiency problems long term and the eldarica pine is a desert tree that suffers under heavy irrigation and rainy periods. Better evergreen tree choices for your garden include live oak, magnolia, yaupon, and eastern red cedar. ELDARICA, OR AFGHAN PINES, are dying out because of too much water. This desert tree can't stand irrigation, high rainfall or poorly drained soils. Answer: Collect the pine cones in the fall before they open and allow them to open in a paper bag to catch the seeds. Store the seeds in a cool, dry place until spring, and then sow them outside. East Texas pine trees will grow well in your county if they are planted in sandy soil.